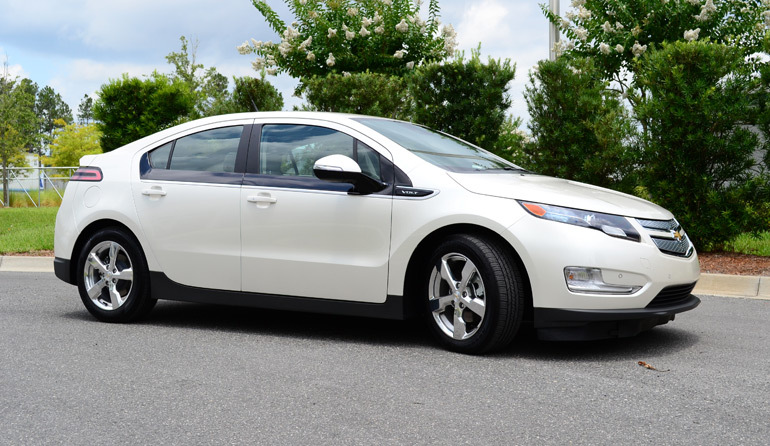 The new 2013 Chevrolet Volt carries on its efficient duties with the addition of a few new features that add to its versatile and innovative electrified platform. 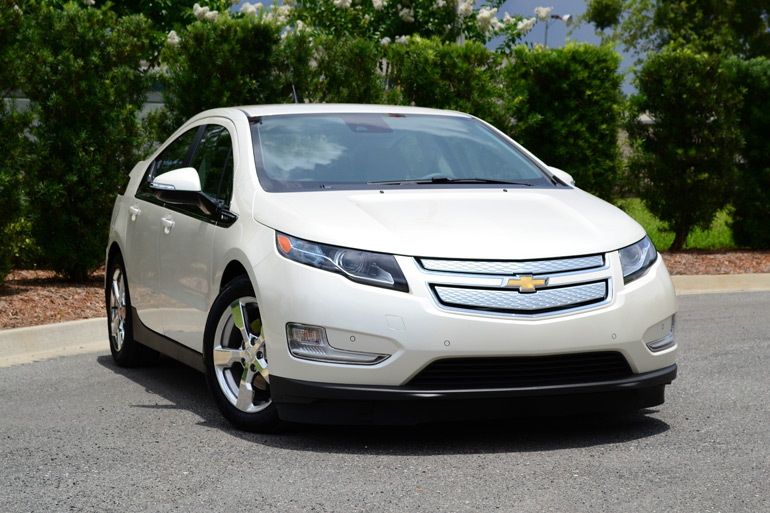 The new 2013 Volt also continues its substantial compliance on the road much like any other midsized or compact sedan virtually streamlining its electric powertrain and gasoline engine generator. 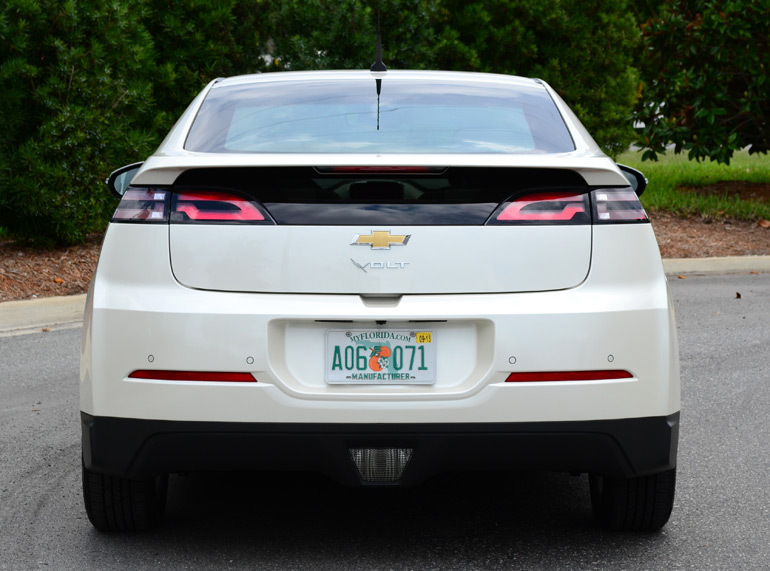 The public has learned much about the Chevy Volt recently where its image is getting more polished each year with slight improvements. The saying goes that it can only get better and Chevrolet has done just that, made the Volt even better even when pitted against its mainstream competition. 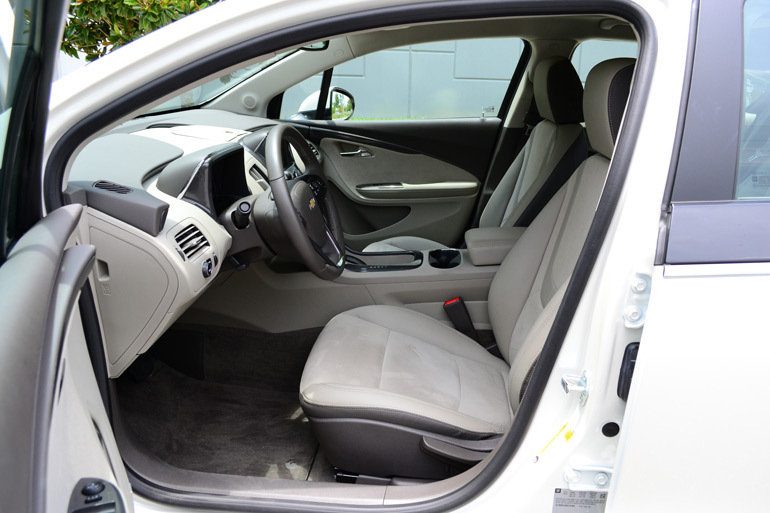 The 2013 Chevrolet Volt receives a new Hold feature adding to the Sport, Normal and Mountain drive modes. The new Hold feature basically holds the battery charge and only utilizes power generated from the 1.4-liter gasoline engine stored in a temporary battery buffer. Essentially, using the Hold feature will allow you to retain all of the wall-charged energy in the new 16.5 kWh lithium-ion battery pack. Previous year Volts included just a 16.0 kWh battery. The new slightly higher capacity boosts the range to an average of 38 total miles solely on a full electric charge. 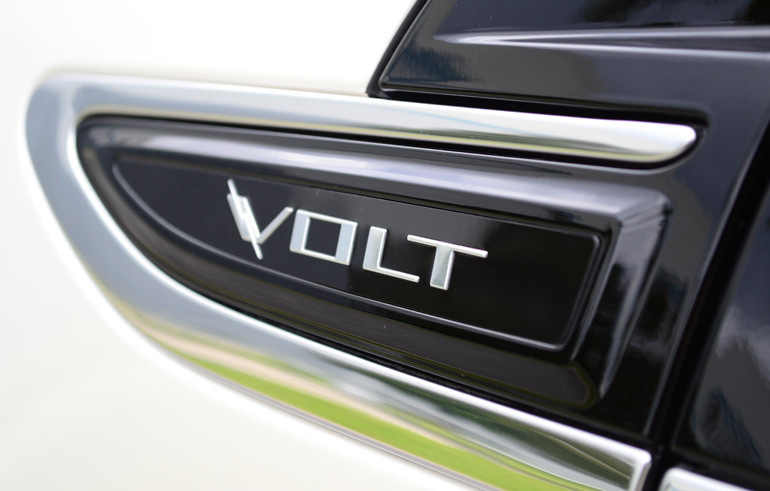 Adding to the total range is the Volt’s ability to utilize the batteries hi-tech-controlled buffer where power is generated from its gasoline engine fed by a 9.3 gallon gas tank. 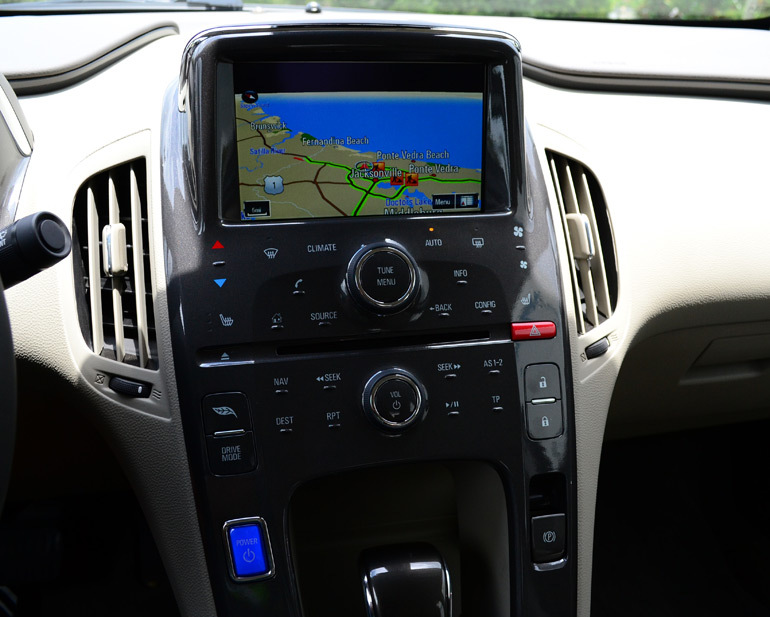 My drive in the new 2013 Chevrolet Volt consisted of a nice mix of highway and densely populated city driving with relatively light traffic. I was able to muster out a total of 43 miles from a fully-charged battery. In all 43 miles I used the air-conditioner and lights as my drive approached sunset. The normal drive mode was used about half of my drive while the other half sport drive mode appeased me most. I took special note to the sport mode advancing the throttle position for a bit more response, something enthusiasts would take pleasure in. The over-night charge (est. 10.5 hours) before my drive used the one of the new selectable charge modes in the faster 12 amps mode vs. the reduced 8 amps mode. Of course using the updated 120-volt wall-charger I noticed a much cooler plug when compared to my review of the 2012 and 2011 model-year Volts. 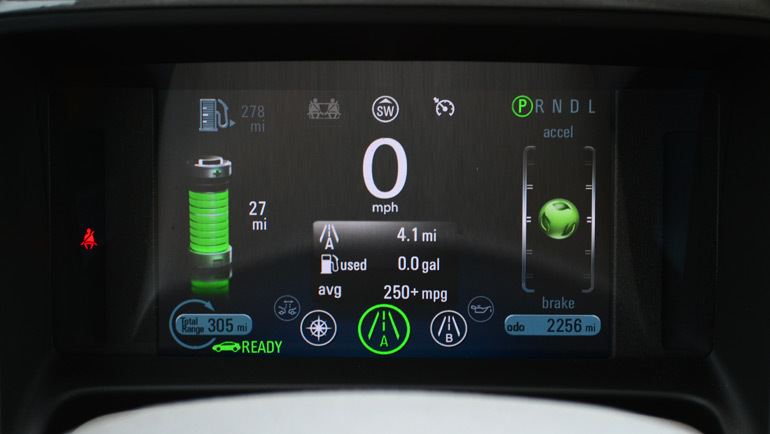 Some have demonstrated more than 50 miles on a single full charge in the new Volt exclusively using the battery charge capacity. 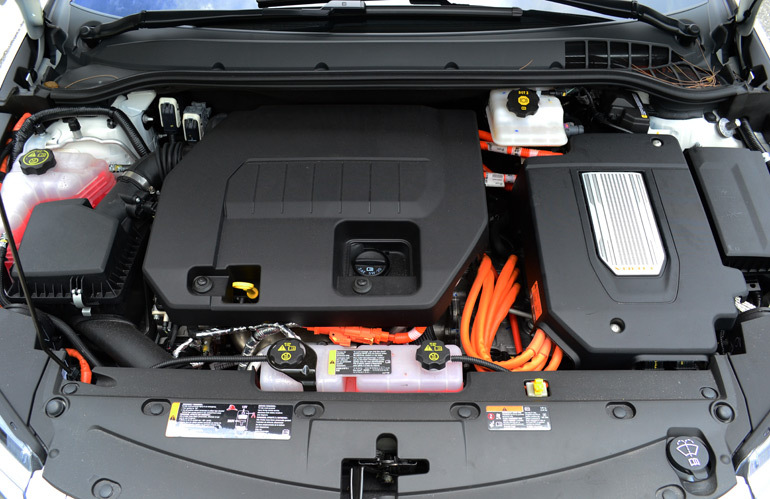 General Motors claims users will see on average of 38 miles on a full charge. As you can imagine, that figure can sway greatly dependent on driving conditions and usage of power accessories such as the climate control. After depleting the battery charge, or using the hold feature exclusively, you will expect to get an average of 37 mpg. I saw just that during my drive with my best figure being 45 mpg and worst coming in at 32 mpg. The 32 mpg figure was due to driving up a few tall bridges and driving ‘slightly above’ posted interstate speed limits. Amazingly, there is a exponential diminishing return when you start to approach 80 mph and eventually topping out at the Volt’s 101 mph electronically controlled top speed. Of course, I found its top speed while on a closed course I was able to use for half an hour. What an experience having this extended range electric vehicle out on a closed course. 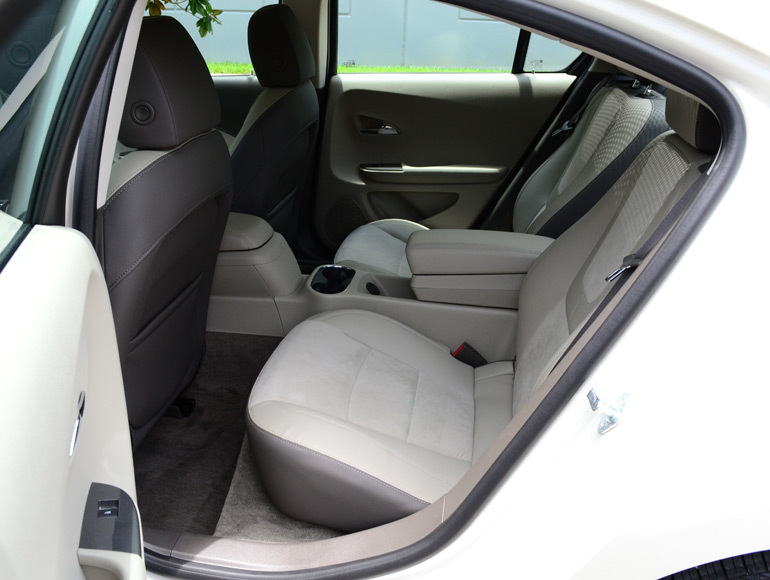 The ride quality of the new 2013 Chevy Volt seemed to be a bit more compliant than previous years. I attempted to find additional information on any spring rate or damper changes but could not confirm any definitive data. 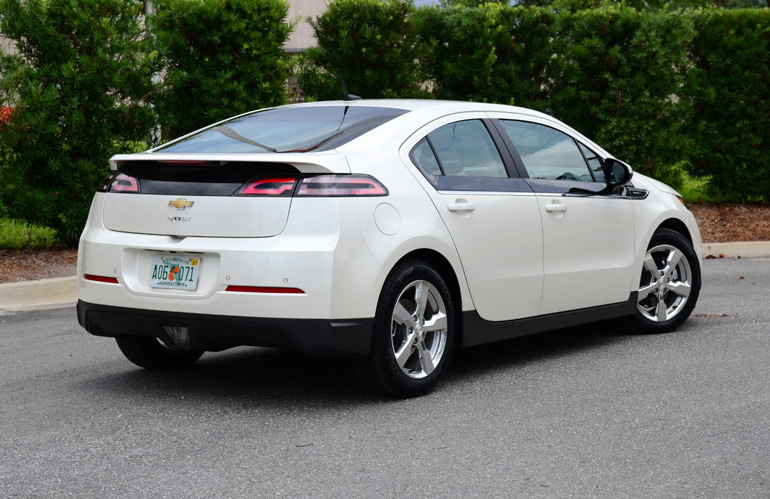 With that said, the 2013 Chevy Volt rides great for its weight and feels well-balanced. 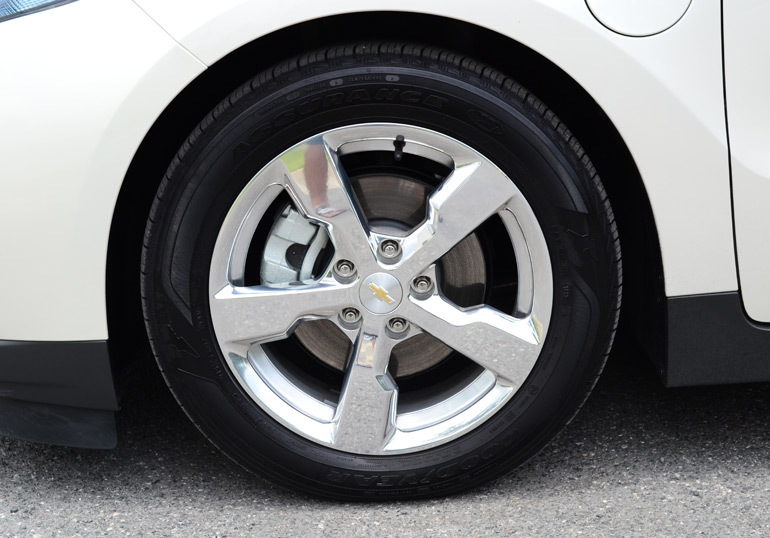 Though, the ultra-efficient low-rolling-resistant tires are prone to screeching at any moderate to hard turn-in exhibiting an abundance of understeer at the mercy of stability control working overtime. The instant torque from the electric motor, a full 273 ft-lbs. 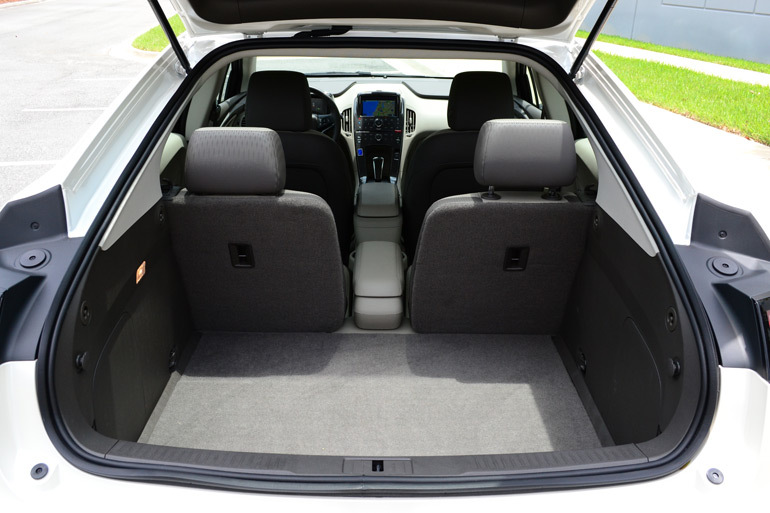 available from a start, really makes the Volt come to life especially in the mix of heavy traffic and highway cruising. Over-all power produced from the electric motor is only 149 horsepower but really rests on its torque figure to get things in motion. You may not win many drag races but you sure can get a jump off of the line and out of the hole with ease having an all-electric platform to propel the vehicle. 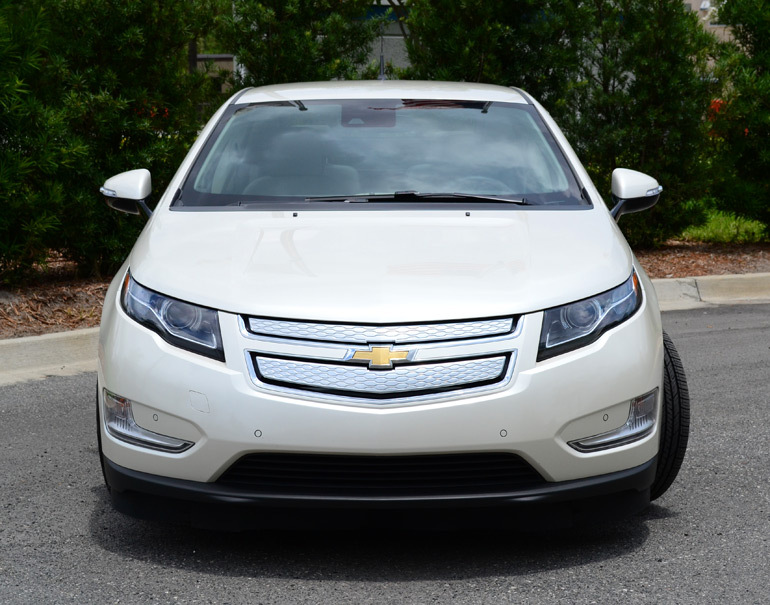 Concluding the new features added for the 2013 Volt is a new lane-departure and forward collision warning system. Of course potential California Volt owners can now rejoice due to the Volt receiving a low-emissions package so they may legally travel in the carpool lanes no matter how many occupants are in the vehicle. 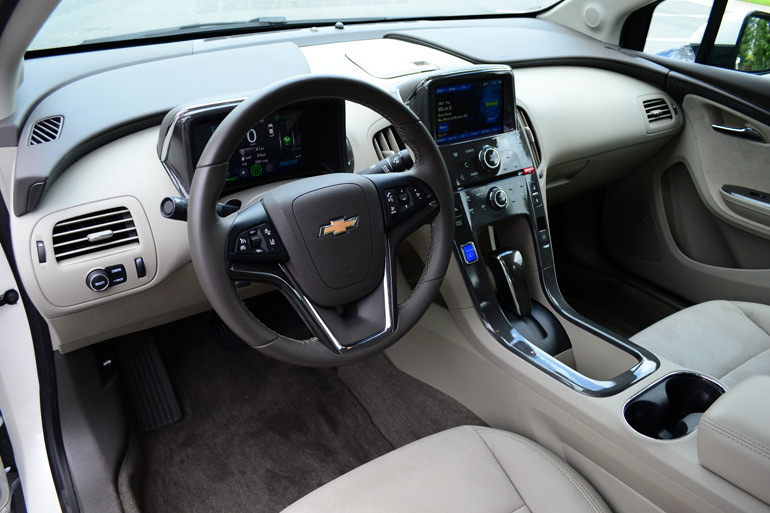 The new 2013 Chevrolet Volt is a factual marvel no matter how you want to slice its innovative drivetrain, complex vehicle management programming all combined to make it a seamless driving experience. The lofty initial pricetag starting at $39,149 before the $7,500 tax credit is probably one of the unattractive aspects of the Volt. Though, adding in the tax credit makes all of the difference in the world for the true economical-minded. With that in mind, the Volt, for some, could very well be a good value and foundational emergence into the future of what is to come from extended –range electric and alternative power vehicles. The as-tested price of my loaded test vehicle came in at $45,540 including a $850 destination charge. Still, a definite a winner in my book… after the tax credit. EPA cargo volume: 10.6 cu.ft.